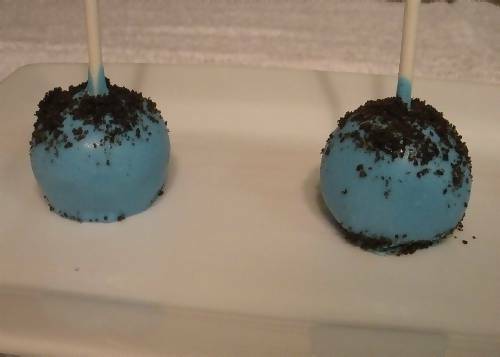 When I first saw these cake pops, I was blown away by how creative and elegant they look. 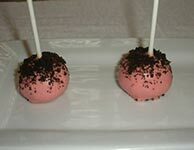 One of the new "hot trends" in parties, they are easy to make, yummy to eat and make your food table look fabulous! 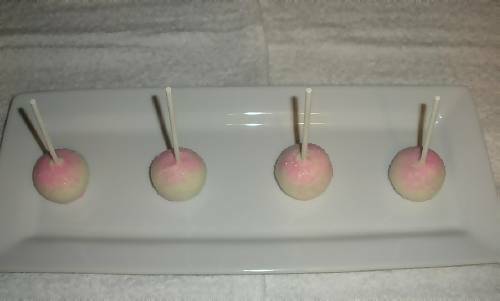 They were an instant hit with the party guests, and EVERYONE wanted to know how to make them. I'll share the easy recipe with you, so you can WOW your guests with your creative talents. Bake the cake following the directions on the box. Let cake completely cool then crumble into a large bowl. Add most of the container of the frosting. 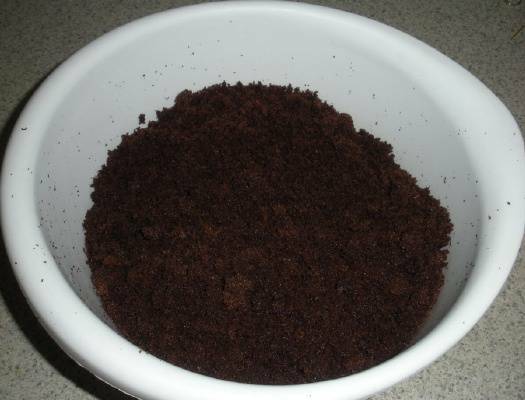 The amount you need will depend on the type of cake you used and how moist it is. 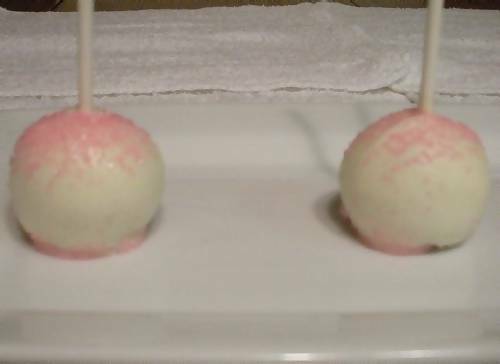 You will want it to be moist enough to easily form balls, but not wet and gooey. Mix well. Lay out the cookie sheet with your wax paper/parchment paper on top. Start by scooping up some of the cake and start forming into a ball. 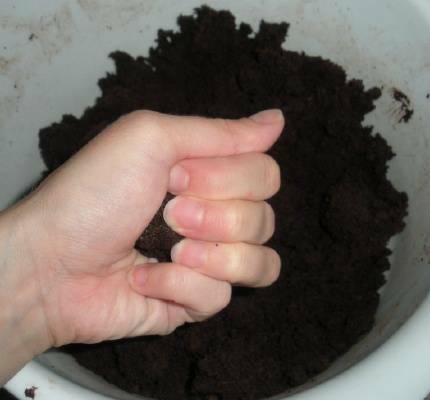 I like to pass it from hand to hand a few times and squeeze some of the air out of it. Roll into a ball that is about the size a quarter. Use your lollipop stick to determine how big the ball needs to be. 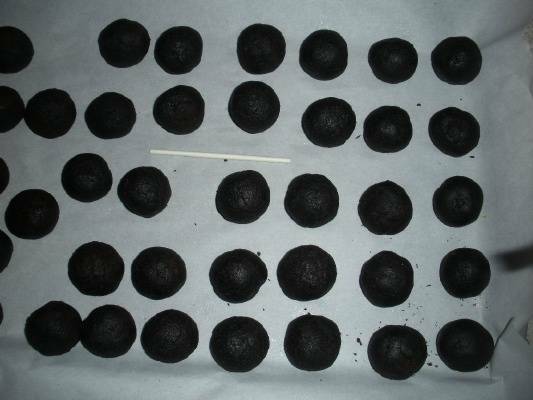 The average cake mix will give you anywhere from 36-50 cake balls, depending on how small you roll them. 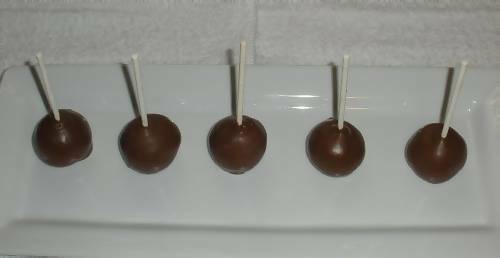 Bigger cake balls will mean less lollipops. Once you have all of the balls formed, place in refrigerator until cold and firm. 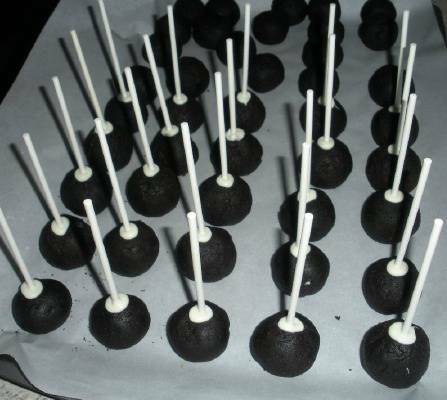 Heat up a small amount of candy melts to attach the lollipop sticks to the balls. Place the candy melts in a bowl and microwave in 30 second increments, stirring in between each time to make sure it is evenly heated. The candy melts will be smooth and not lumpy when it is ready to use. 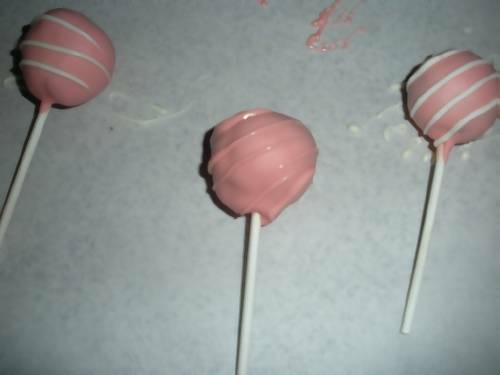 Dip the tip of each lollipop in the candy melts and push the stick a little less than half way into the ball. 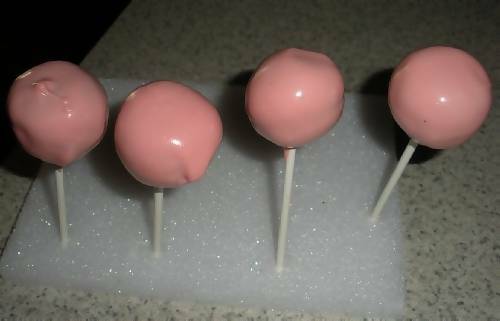 Once you have attached all of the lollipops, transfer the cookie sheet with the cake pops on it into the freezer for 10-15 minutes. Remove tray from freezer and place in the refrigerator while you dip a couple pops at a time. Make sure the pops are firm and cold before you start to dip them. Ready for the fun?! Dipping and decorating is my favorite part! Heat up the candy melts in a bowl in the microwave like above (stirring every 30 seconds until smooth). 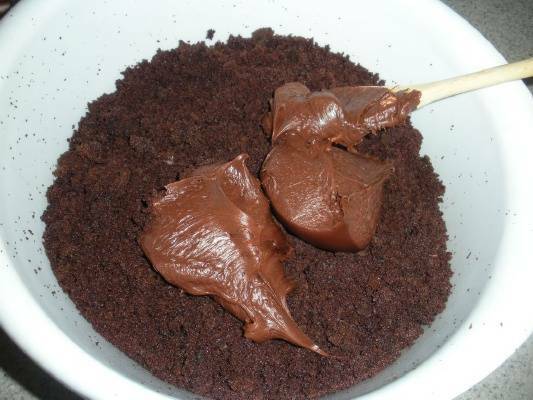 This time, use enough to cover the cake when you dip it. 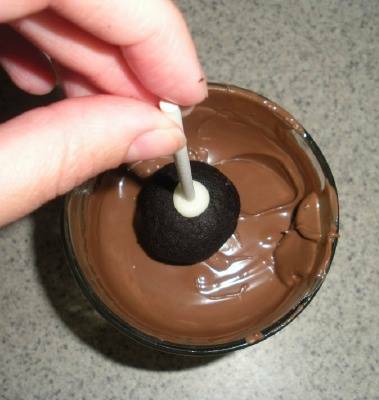 Hold the cake pop by the stick and dip in the melted chocolate. 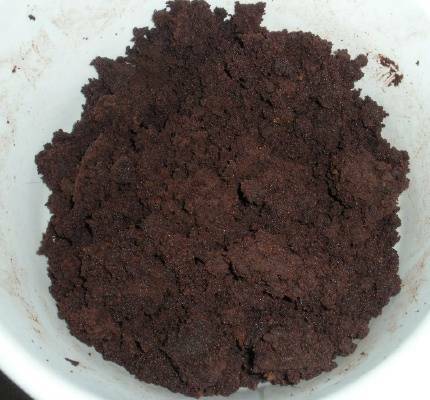 Use a spoon to help cover the parts that are harder to cover when dipping. 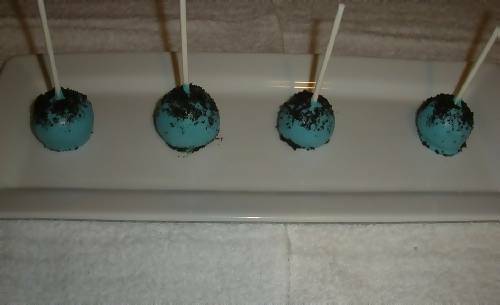 Be careful not to twist too much or heat up the chocolate around the stick or you will dislodge the lollipop stick out of the ball. The more you turn and twist it, the rougher the chocolate will look on the surface. Try to dip straight down to give a smooth look. 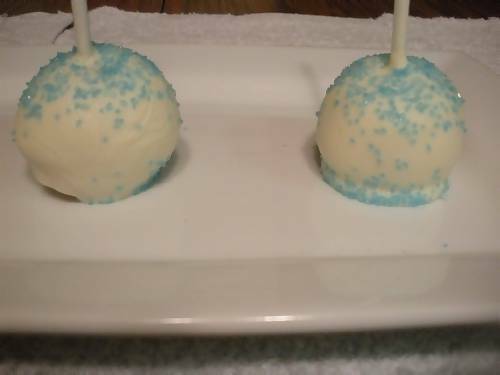 Once your cake pop is covered, use your spoon to scrape the excess off the bottom. This will keep the chocolate from pooling when you set it down. Set it on your wax/parchment paper to cool. 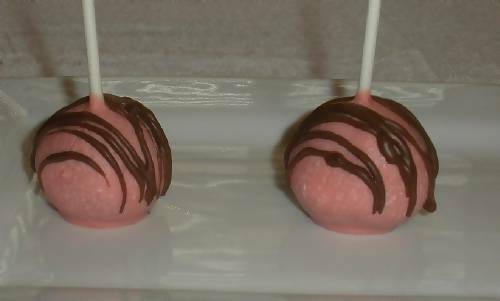 Tip: If the chocolate starts to pool at the bottom while it is drying, use a toothpick or edge of a knife to separate the pool from the lollipop and give you a smooth edge. Decorate! 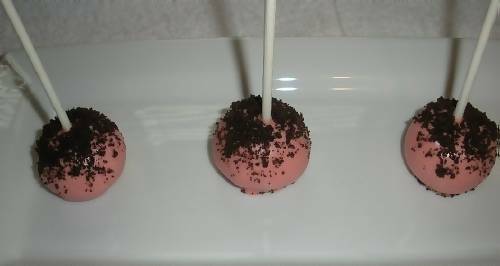 Some decorations will need to be done while the cake pop is still wet(sprinkles, Oreos, etc.) and some of them are okay to wait until it is dry (drizzling). Place in an airtight container away from heat to store until the party. 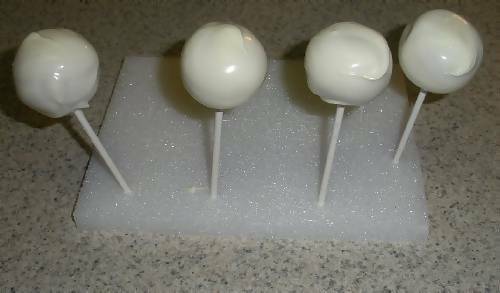 Create cake lollipops by sticking the lollipop stick into Styrofoam to let it dry. This will keep the top nice and round, just like a lollipop! 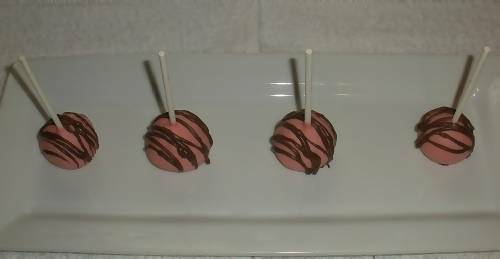 Pink drizzled with white and pink chocolate. 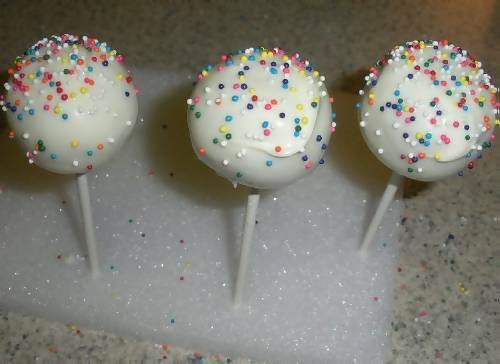 Lollipop sprinkled with candy sprinkles. 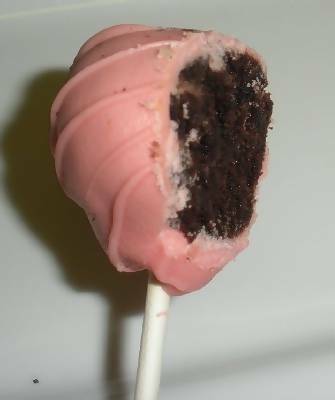 The inside of a chocolate cake lollipop covered with pink chocolate.